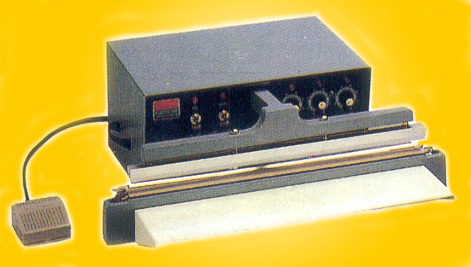 Unlike manual sealers, these automatic sealers are fully adjustable for AUTOMATICALLY controlling sealing time, dwell time, and sealing speed. Available in either 14", 18" or 24" seal lengths with your choice of 2mm seal width (1/8") or 5mm seal width (1/4"). Automatic Sealers will seal most heat sealable materials and are especially suited for high volume sealing of polyethylene bags and polypropylene bags, up to 12 mil in thickness. Automatic impulse bag sealing with precise electronic control. Convenient for high volume packaging. Easily seals up to 12 mil thick bags. High efficiency and compact in size. Can't decide which seal width (1/8" or 1/4") you need? Send us some of your bags! We'll "sample seal" everything for you, carefully label each and return to you at our expense. This way you can judge for yourself which seal is better for your needs before you buy! We Want You Satisfied with your purchase! Free Shipping for Repair Kits, Spare Heating Element Wires, PTFE Tapes and Cloth/Fabric kits when you buy three, as well as a HUGE inventory of poly bags and tubing, cellophane bags and shrink wrap, shrink bands and shrink tubing. Free Shipping on impulse sealer repair kits and heating element wires when you buy three kits! Factory Authorized Service. We stock parts for AIE, TEW, KF, Midwest Pacific and nearly any of brand of sealer! Service Kits, Call us for 18 yard long full rolls of Non-Stick PTFE Tapes and Cloth and Fabric , as well as a HUGE inventory of poly bags, cello bags and vacuum pouches! Call Us!